After the spa I definitely wanted to give making my own cracker a try. I figured now was the time since I wanted to start packing some “gourmet lunchables” for my husband to just grab and go to work with. He is no longer on a ship so he actually has to bring his lunch to school er..work with him. Hehe. He spends a lot of his lunch helping folks out with their computer stuff so even though he packs a lunch sometimes he doesn’t get to eat it. I figured a quick grab deli tray might be the answer. So I made up some of these crackers, bought some spicy cheese at the market, and smoked some chicken for cold cuts. Yes, I have a deli slicer…yes…I have a kitchen appliance problem. I have a lot of them and use them all! *snuggles her kitchen appliances…ouch! * Anyways, rather than buying those high fat and boring lunchables I decided to put together something more fun, tasty, and healthy. I packed up all he needed for the week after watching True Blood (omg!) and it only took me half an hour of leisurely slicing and assembling. He is all set now! definitely a winner. So here is my first cracker attempt, and they worked! Combine the flour, salt, and seeds. Stir in the oil and half of the water. Slowly add more water as needed while you combine until a nice dough ball is formed, not too sticky but not too dry. Roll out the dough to 1/4″ thickness on a silicon baking mat. Transfer the mat to a baking sheet. Cut using either a knife or a pizza slicer into 48 squares. Bake at 400F for 20-25 minutes or until they brown nicely on top. Makes 48 crackers. Each cracker is 15 calories, .7 grams of fat and .2 grams of fibre. This is a nice basic recipe, switching out the seeds for any other seed of choice shouldn’t be a problem at all. So easy too! I had the crackers in the oven toasting up within 10 minutes of starting them. A lovely way to customize your own fancy crackers for tasting trays. 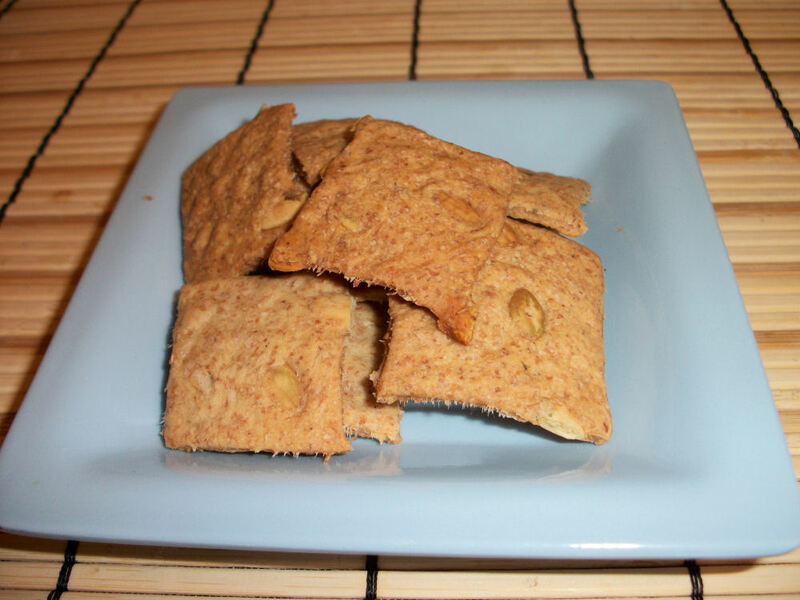 This entry was posted in Sidedish, Snack and tagged Cracker, Pumpkin seed. Bookmark the permalink.